The heart of any pneumatic system is the air compressor. Without air in the proper amount and at the correct pressure, all control would be lost. A compressor that is too small will not last long and may even result in poor, erratic, system performance. A compressor that is too large wastes money. Therefore, the proper selection of the air compressor is very important. Through experience, certain criteria have been developed for the selection of a proper pneumatic system air compressor. An air compressor should be selected to run 1/3 to 1/2 of the time, based on average air consumption of a system. Average air consumption is expressed in standard cubic feet per minute – SCFM. Compressors are rated in SCFM at a given tank pressure, usually 80 psig. Sizing a compressor is matching the compressor capacity to a system’s requirement. The consumption of each air-using device in a system is taken into consideration. Relays, thermostats, switches, transmitters, and all devices that use air must be considered, and the compressor should be sized so that when operating, 1/3 to 1/2 of the time it will deliver enough air to satisfy the average air requirement of a system. One method of sizing is the “Equivalent Air Units” method. The basic equivalent air unit is a relay type controller. Air used by a relay type controller is 0.008 SCFM. 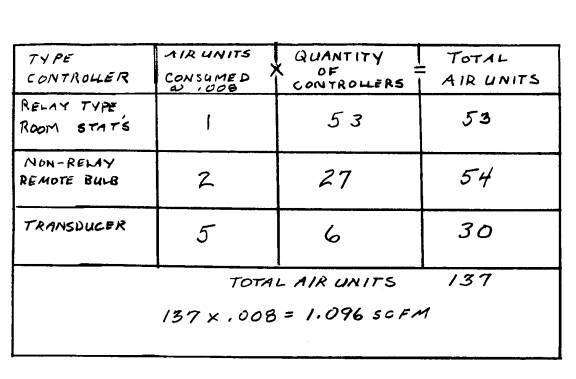 Using this as a base, all other types of controllers are rated in units of air consumed. Ratings may be shown or expressed in SCFM or SCIM. “SCIM” is Standard Cubic Inches per Minute. There are 1728 cubic inches in a cubic foot. To arrive at SCFM when SCIM is known, divide the SCIM by 1728. As an example, the R516 reversing relay is listed in a Robertshaw catalog as using 29 SCIM. By taking 29 and dividing by 1728, one will get 0.016. The R516 uses 0.016 SCFM. Using the equivalent air units method of sizing, the R516 would be equal to two units (0.016 divided by 0.008 equals 2). A device what would use 0.024 SCFM would be equal to three units and so on. A simplified example of calculating air consumption units is shown in Figure 1. Of course, one could always add up all the actual air consumption of the devices in a system, but the equivalent air method is faster, less prone to addition errors, and will be close enough in calculated air usage to result in proper compressor selection. The next step is to select the percent of run time for the compressor to supply the needed air for the system. Using 50% run time will result in a smaller output compressor and less expensive compressor than one sized based on 33% run time. But, while the smaller unit may be less expensive initially, it will cost more in the long run. A compressor sized for a 33% run time should last twice as long as one sized for 50% run time. For 50% run time, a multiplier of 2 is used. For 33% run time, a multiplier of 3 is used. An altitude compensation factor needs to be applied, if necessary. If the compressor were to be used at a level of 2,000 feet above sea level, the compressor will lose approximately 5% of its capacity. At 4,000 feet, the compressor loses 12% capacity, 20% at 6,000 feet, 25% at 8,000 feet, and 30% at 10,000 feet. If our example compressor were to be installed in a building 4,000 feet above sea level, the altitude compensation factor would result in a compressor output requirement of 2.46 SCFM at 50% run time (2.192 x 1.12 =2.46). Another part of the air supply system is a storage tank. The storage tank capacity, expressed in gallons, should be large enough to smooth out intermittent peak loads. The number of starts per hour is usually selected as six or ten. Six results in longer off time. The longer off time means a larger tank, which will be more expensive than a smaller tank. If initial cost is the most important criteria for selection, then 50% run time and ten starts per hour should be used. If long life, less maintenance, and consequently lower cost over the life of the system is the criteria for selection, then 33% run time and six or ten starts per hour should be used. Using our example system requiring 1.096 SCFM, we can complete both possible selections (altitude compensation not included). Selection of the units can now be made using the manufacturer’s catalog information. Standard tank capacities closest to our calculations would be selected. Standard tank capacities are 30, 60, 80, 120, 200, 240 gallons, etc. In our examples, 30 gallon and 120 gallon tanks would be selected. Picking a tank closest to the calculated capacity is acceptable practice. The compressor must equal or be greater than calculated need – never less! The two major components of our air supply system have now been determined, but the actual selection of the compressor assembly is far from completed. Now we need to know the tank and compressor configuration as well as accessories. Basic tank-mounted units include a pressure switch (two switches on duplex units), safety valve, one pressure gauge, manual tank drain, and a manual shutoff valve at the tank discharge. Basic base-mounted units will have a pressure switch (two switches on duplex units) and check valves. Base mounted units do not come with a storage tank. 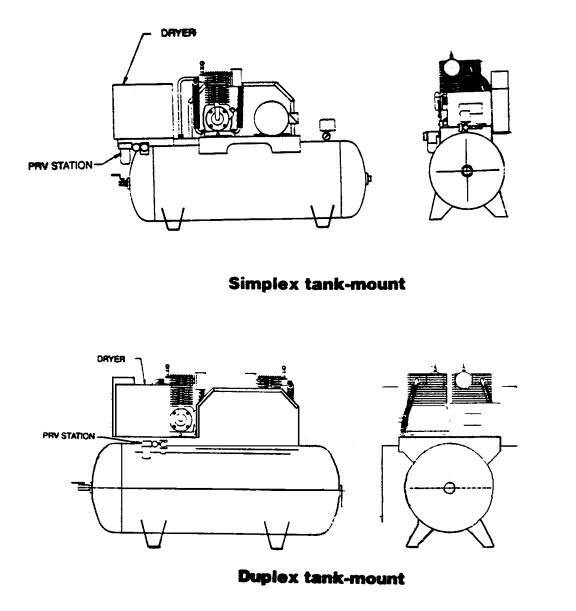 Figure 2 shows typical tank-mounted units, Figure 3 shows typical base-mounted units. Motor voltage and phase. Single-phase units are available up to three horsepower. Three phase units are available in all sizes. Simplex or Duplex? 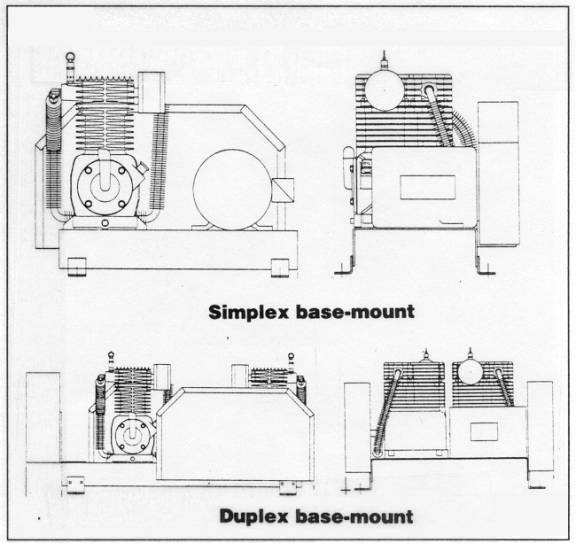 “Simplex” simply means there is one motor and compressor. “Duplex” units have two motors and two compressors. Once the basic unit has been determined, other accessories will probably be needed. While the accessories are options, many of them are needed to complete a new installation of an air compressor unit. For tank mounted simplex units, motor starter panels have a motor starter in a NEMA 1 enclosure, all factory mounted and wired. Duplex unit motor starter panels for tank or base mounted units have two starters, an alternator with a three position switch to select individual compressors or automatic operation, and a 120 VAC control transformer. All these components are factory mounted and wired in a NEMA 1 enclosure. A Duplex unit without this panel would be wasting the money spent on a Duplex unit. In the “Auto” mode, the compressors alternate as the lead compressor and accumulate equal run time. This compressor alternation dramatically extends their service life. Should one compressor fail, the operable compressor can be selected to supply the system, while the failed compressor is repaired or replaced. The whole object of a Duplex unit is to have air available at all times so there will never be a system failure due to lack of air. A Duplex control panel assures this, automatically! The basic tank-mounted unit comes with a manual tank drain, but most units are left unattended once they are installed. It is best to have the “Automatic Electronic Tank Drain” option included. The auto tank drain includes a manual bypass. The pressure switches on all simplex units are factory set at “on” at 70 psig and “off” at 90 psig. On Duplex units, one switch is set 70 and 90 psig, the lead compressor, and one switch is set 60 – 80 psig, the lag compressor. Pneumatic system control air is usually 20 psig, so a pressure reducing station is needed. A.P.R.V station includes a coalescing filter, pressure regulator, and two pressure gauges. Pneumatic system air must be clean and dry! For tank-mounted units rated up to 35 SCFM, a factory-mounted and piped air drier is a convenient option. When the air drier is included in the factory package, the manufacturer will size the drier for a 33% operating cycle. No factory mounted air drier is available for any base-mounted unit or for tank-mounted units over 35 SCFM. In those cases, the drier comes as a separate item. Isolation pads and isolation springs are factory available to mount the compressor assemblies. They reduce the transmission of vibration and noise to the surrounding structure. They come in sets of four. Pads are made of an elastomeric material, and can be used on units that use up to a 240-gallon tank. Pads used on units up to 80 gallon tanks are 4” x 4” x 1” thick, pads up to 240 gallon tans are 6” x 6” x 1” thick. There are two spring sets. One set for units up to 1400 lbs. And another set for units weighing over 1400 lbs. Because of much improved compressor technology, compressor capacities per horsepower greatly increased, which actually resulted in cost per SCFM going down! Consequently, 1/3 horsepower unit production ceased in 1994. The smallest compressor now available is 1/2 horsepower and its output is 4.4 SCFM at 80 psig. This output is equivalent to an old one horsepower unit. All the other size compressors also had capacity increases by horsepower. Make sure to use up to date catalogs when selecting units.